UK newspaper The Observer has published in its “Browser” column a rather stuffy criticism of Puffin’s Young Bond 3 title poll, calling it a “shameful failure of imagination.” Now Puffin has responded. 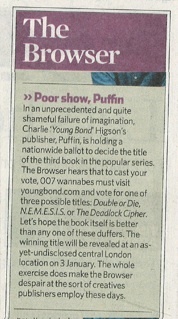 The Browser somewhat missed the point of our nationwide vote to decide the title of Charlie Higson's third Young Bond book (visit www.youngbond.com for details). This is an initiative designed to encourage young fans to interact very directly with their favourite book brand in ways that they are wholly accustomed to doing with brands outside the book world - text voting, e-flyers and on-line polls are very much part of our readers' lives, and a natural way for them to express their opinions, share ideas with friends and be active members of a community linked by shared interests. It also gives us as publishers of books for children a real opportunity to listen to their opinions. I am sorry that we are a source of despair to the Browser! While he is perhaps not part of our target market, he does correctly highlight the fact that those of us following in the footsteps of Ian Fleming have a lot to live up to. Charlie Higson's brilliant Young Bond books are a very fresh perspective on the Bond we all know from the adult novels and films. Fleming's titles are absolutely iconic, and we'd love as many people as possible to be involved in making sure that the title for the next Young Bond novel is the right one. If the Browser really wants to be part of the decision, he could always vote.